Over 300,000 Views since 2008 - Coaching :The Good TimesThis period of my life I call THE GOOD , because of the valuable experiences and opportunties that I was given . These experiences not only made me a better coach , but also a better person. As a coach , I truly found my calling . I love the game , I loved the kids and I found early success. During the six years I coach Junior High Basketball , we won one champioship at JS Spivey JHS and four Championships At Washington Drive JHS . During that time there were 12 junior high schools in the county and we had five championships and a six year record of 72-12. In 1979 I coached one year at EE Smith , as Junior Varsity basketball Coach under Ike Walker and our team won the JV Conference Championship with a 18-2 record. I left E.E. Smith after one year to pursue a better opportunity for a head coaching position . With 8 years of coaching experience , I felt I was ready and prepared for a head coaching position. Also, it was known that Coach Walker had plans to stay at Smith for the next 10 to 15 years until his retirement . A year later , I was hired as assistant varsity football coach and JV. Basketball Coach at Northern Nash in Rocky Mt. NC. Northern Nash was a good positive learning experience for me. I learn most of my basketball coaching skills from Bobby Dunn , he was one on the best fundamental basketball coaches that I had the opportunity to work with. The football staff at Northern with head coach Walter Barnill and John Grady , Ron Aiken and Bill Hill were just like family. After two years as Assistant Varsity football coach and JV basketball coach at Northern Nash , I accepted my first head coaching position. In 1981 I accepted the Head Basketball and JV football position at Northwest Halifax high school in Roanoke Rapids , NC. My first year as a high school Head Basketball Coach was a losing season , the first losing season I had experienced while coaching . But on the bright side , my JV football team went undefeated 8-0 and won the Roanoke River JV Conference Championship. At the end of my first year , my principal promoted me to Head Varsity Football and Head Track Coach. I told him that I did not want to give up basketball , so he also gave me JV Basketball. 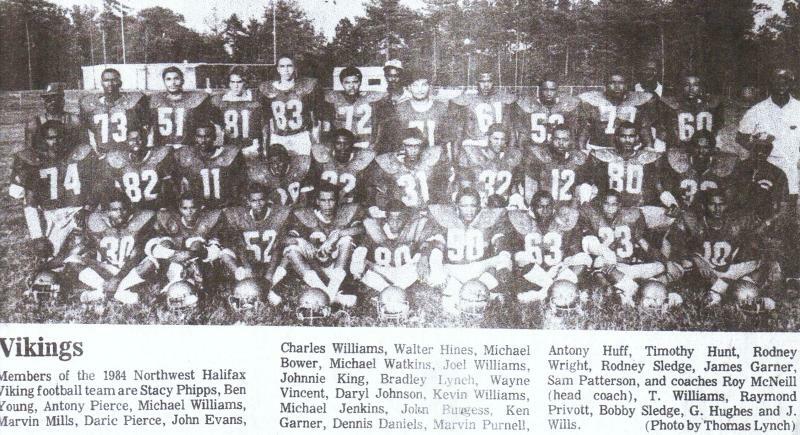 At that time I was the first black head football coach ever in the Roanoke River Conference.. In 1982 there was 285 varsity high school football programs in the state of North Carolina , but there were only three black head football coaches at that time ; the coach at West Charlotte HS , Bill Carver at EE. Smith HS. and I was at Northwest Halifax. In the five years as a head football coach , I never coached against another black coach , as you can see , very few of us existed. My first season as a head football coach was very interesting ; we had a second place finish , went 8-2 and made the play-off for the first time in the schools 17 year history , but We lost in the first round of the state play-offs to an outstanding Bertie County High School out of Windsor , NC. By the way , my JV basketball team went 20-0 and won the Roanoke River Conference. Also , my track team at Northwest won 42 consecutive regular season track meets and four conference championships. 1982 was my most amazingly season , Coach of the Year in JV. Basketball and Coach of the Year for four consecutive years in Men's Track . Now , before I stick my chest out or put the Halo around my head; let me say this , " I was blessed with some really smart and talented kids that love each other and played together" and four great assistant coaches "Coach Sledge, Coach Privatt, Coach Scott & Coach Hughes. A coach is no better than the quality of players that he can put on the field. As Coach Bear Bryant put it " You got to have the horses". That year I just had the horses. In 1986 I left Northwest Halifax and accepted a head basketball coaching position at Wilson Hunt High School in Wilson , NC. Also that year Earl moved to Rocky Mount and accepted the Head Men's Basketball coaching position at Williamston High School about 35 miles from Rocky Mt. During most of the next two years , we lived together and we worked closely together in our coaching. Wilson Hunt HS was not the most accepting school for me as a head coach. There was little or no support for the program. The first week I was hired , I was to be introduced to the booster club during a meeting at Parker Barbecue . When I walked in , all of the members walked out. Wilson Hunt was the high school in the elite white neighborhood. Believe me , I felt like Obama facing the GOP ". My two years at Hunt HS. weren't very sucessful , we won some games , but I never felt comfortable or felt that this was the right place for me to be. In 1988 I decided to move back to Fayetteville and accepted a Head coaching person at Littlefield High School in Lumberton , NC. I was only at Littlefield one year before moving to Westover High School as Assistant football and Head track coach. Working at Westover was one of the best positions I had ever had. Working on the football staff of Milton Butts was not only successful , gratifying and enjoyable , he treated every coach as family. I learned at lot from him in terms of handling a staff and relating to parents in a positive way. During the four years at Westover I was Coach of the Year in Men's Track during my second season and was given the opportunity to coach the Varsity Girls basketball team during my fourth season , inwhich I truly enjoyed. Coaching girls was a lot of fun...I will always cherish that experience. Our team finished the season in second place with a record of 22-4 . In 1993 I accepted the basketball position at EE Smith. That was fun time for me as well as for the players and the staff. We had a staff that laughed and joked on each other five days a week. I really loved those days. Coach Billinglea, Purcell, McAllister, Adams, Holmes and I were like my family , I will never forget those guys. During my tenure we were very productive.We won: Two Conference Titles, a Holiday Tournament , A Conference Tournament , Three Sectional Championships , Three Regional Tournament Appearces (top 8 teams in the state) , a Regional Champioship Game, produced two Conference Players of the Year, had 13 players to go on and play college basketball , had 9 straight winning seasons , had 9 straight play-off appearances, 6 seasons of 20 or more wins and a overall record of 185-62 for a 75% winning record. This period of my life I call THE GOOD , because of the valuable experiences and opportunties that I was given . These experiences not only made me a better coach , but also a better person. As a coach , I truly found my calling . I love the game , I loved the kids and I found early success. During the six years I coach Junior High Basketball , we won one champioship at JS Spivey JHS and four Championships At Washington Drive JHS . 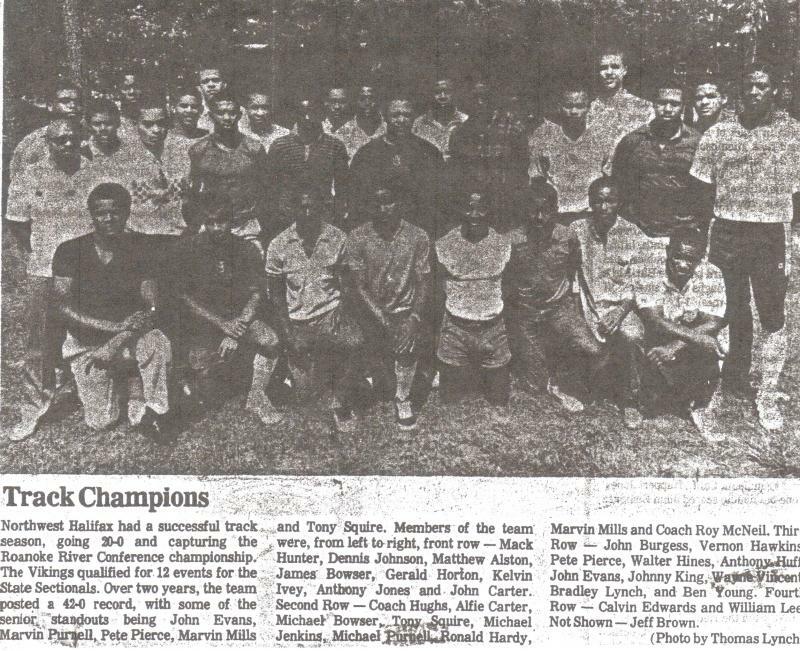 During that time there were 12 junior high schools in the county and we had five championships and a six year record of 72-12. 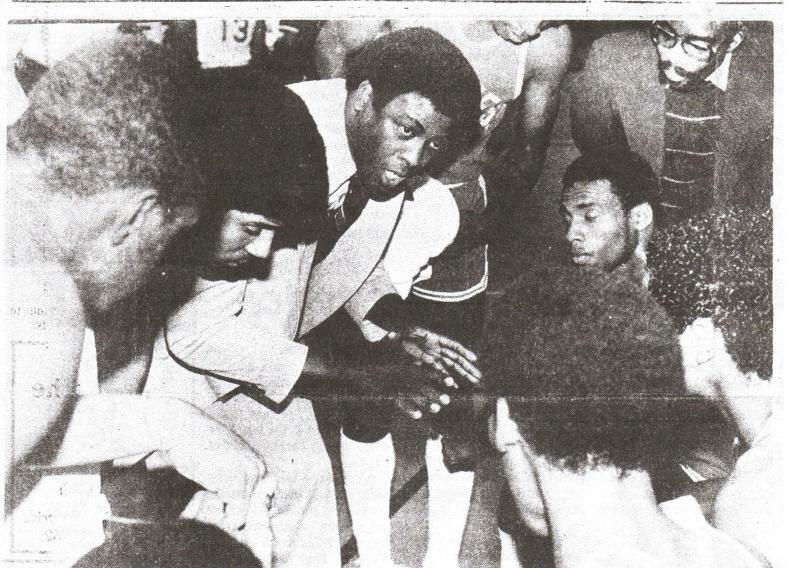 In 1979 I coached one year at EE Smith , as Junior Varsity basketball Coach under Ike Walker and our team won the JV Conference Championship with a 18-2 record. I left E.E. Smith after one year to pursue a better opportunity for a head coaching position . With 8 years of coaching experience , I felt I was ready and prepared for a head coaching position. Also, it was known that Coach Walker had plans to stay at Smith for the next 10 to 15 years until his retirement . A year later , I was hired as assistant varsity football coach and JV. Basketball Coach at Northern Nash in Rocky Mt. NC. Northern Nash was a good positive learning experience for me. I learn most of my basketball coaching skills from Bobby Dunn , he was one on the best fundamental basketball coaches that I had the opportunity to work with. The football staff at Northern with head coach Walter Barnill and John Grady , Ron Aiken and Bill Hill were just like family. After two years as Assistant Varsity football coach and JV basketball coach at Northern Nash , I accepted my first head coaching position. In 1981 I accepted the Head Basketball and JV football position at Northwest Halifax high school in Roanoke Rapids , NC. My first year as a high school Head Basketball Coach was a losing season , the first losing season I had experienced while coaching . But on the bright side , my JV football team went undefeated 8-0 and won the Roanoke River JV Conference Championship. At the end of my first year , my principal promoted me to Head Varsity Football and Head Track Coach. 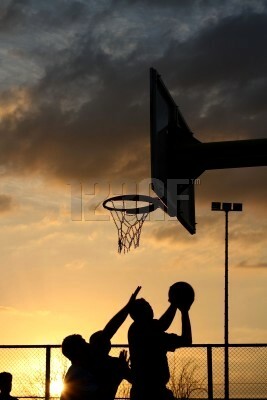 I told him that I did not want to give up basketball , so he also gave me JV Basketball. At that time I was the first black head football coach ever in the Roanoke River Conference.. 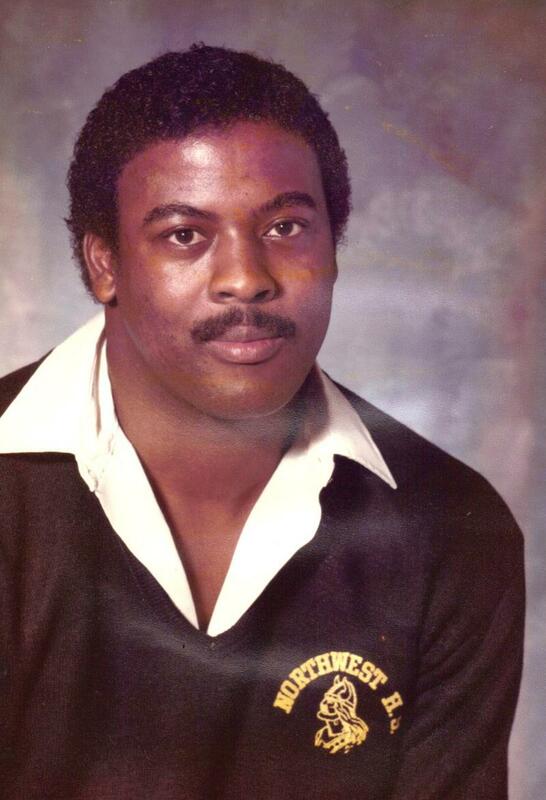 In 1982 there was 285 varsity high school football programs in the state of North Carolina , but there were only three black head football coaches at that time ; the coach at West Charlotte HS , Bill Carver at EE. Smith HS. and I was at Northwest Halifax. In the five years as a head football coach , I never coached against another black coach , as you can see , very few of us existed. My first season as a head football coach was very interesting ; we had a second place finish , went 8-2 and made the play-off for the first time in the schools 17 year history , but We lost in the first round of the state play-offs to an outstanding Bertie County High School out of Windsor , NC. By the way , my JV basketball team went 20-0 and won the Roanoke River Conference. Also , my track team at Northwest won 42 consecutive regular season track meets and four conference championships. 1982 was my most amazingly season , Coach of the Year in JV. Basketball and Coach of the Year for four consecutive years in Men's Track . Now , before I stick my chest out or put the Halo around my head; let me say this , " I was blessed with some really smart and talented kids that love each other and played together" and four great assistant coaches "Coach Sledge, Coach Privatt, Coach Scott & Coach Hughes. A coach is no better than the quality of players that he can put on the field. As Coach Bear Bryant put it " You got to have the horses". That year I just had the horses. In 1986 I left Northwest Halifax and accepted a head basketball coaching position at Wilson Hunt High School in Wilson , NC. Also that year Earl moved to Rocky Mount and accepted the Head Men's Basketball coaching position at Williamston High School about 35 miles from Rocky Mt. During most of the next two years , we lived together and we worked closely together in our coaching. Wilson Hunt HS was not the most accepting school for me as a head coach. There was little or no support for the program. The first week I was hired , I was to be introduced to the booster club during a meeting at Parker Barbecue . When I walked in , all of the members walked out. Wilson Hunt was the high school in the elite white neighborhood. Believe me , I felt like Obama facing the GOP ". My two years at Hunt HS. weren't very sucessful , we won some games , but I never felt comfortable or felt that this was the right place for me to be. In 1988 I decided to move back to Fayetteville and accepted a Head coaching person at Littlefield High School in Lumberton , NC. I was only at Littlefield one year before moving to Westover High School as Assistant football and Head track coach. Working at Westover was one of the best positions I had ever had. Working on the football staff of Milton Butts was not only successful , gratifying and enjoyable , he treated every coach as family. I learned at lot from him in terms of handling a staff and relating to parents in a positive way. During the four years at Westover I was Coach of the Year in Men's Track during my second season and was given the opportunity to coach the Varsity Girls basketball team during my fourth season , inwhich I truly enjoyed. Coaching girls was a lot of fun...I will always cherish that experience. Our team finished the season in second place with a record of 22-4 . In 1993 I accepted the basketball position at EE Smith. That was fun time for me as well as for the players and the staff. We had a staff that laughed and joked on each other five days a week. I really loved those days. Coach Billinglea, Purcell, McAllister, Adams, Holmes and I were like my family , I will never forget those guys. During my tenure we were very productive.We won: Two Conference Titles, a Holiday Tournament , A Conference Tournament , Three Sectional Championships , Three Regional Tournament Appearces (top 8 teams in the state) , a Regional Champioship Game, produced two Conference Players of the Year, had 13 players to go on and play college basketball , had 9 straight winning seasons , had 9 straight play-off appearances, 6 seasons of 20 or more wins and a overall record of 185-62 for a 75% winning record. The purchasing a car is generally one of the biggest and most involved decisions that people have to make. Buying a Corvette is extra-important because chances are good that you're making a substantial cash investment, and a Corvette isn't just a grocery-getter. Your Corvette is a special purchase, and you want it to be a decision you can look back on with pride . So, how do you buy a Corvette? How do you know you're making the right purchase decision? Copyright July 1, 2008 VETTE HOBBY , THE WINNERS CIRCLE. All family images and content are property of VETTEHOBBY. COM. No reproduction or use of images is permitted without expressed consent. This is a Family Site and intented for the purpose of enjoyment and entertainment Only.